With its ambiance of a private Mediterranean villa, Hotel Los Gatos and Spa, has just been selected for Sunset Magazine’s “Sunset Loves Us…” distinction. This boutique hotel is one of only 12 hotels within the greater San Francisco Bay Area to earn Sunset Magazine editors’ seal of approval. In the foothills of the Santa Cruz Mountains, the quaint historic town of Los Gatos and Hotel Los Gatos and Spa, have long been considered a “best kept secret” for a Bay Area getaway. The hotel is also an ideal choice for the business traveler. An hour south of San Francisco and 12 miles from the San Jose airport, Los Gatos is perfectly situated for both business and leisure travelers. Business travelers will be happy to learn that there is an appealing option to a generic big box airport hotel. While located in the heart of Silicon Valley, the hotel’s tucked-away grounds and enclosed Mediterranean courtyard provide a retreat where travelers can unwind and relax. Hotel guests can enjoy spa services, the outdoor pool, whirlpool, the patio bar and outdoor atrium lounge. Fine dining can be enjoyed at DioDeka, the 2011 and 2012 two Michelin-starred restaurant on the property. A fitness club located across the street provides complimentary access for hotel guests. 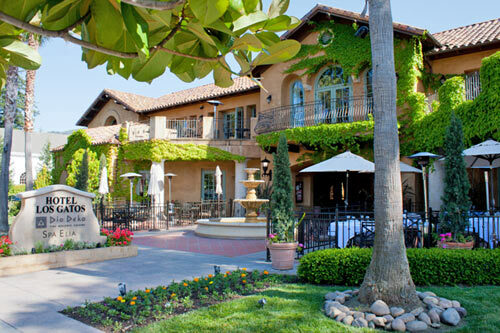 While the area is home to some of Silicon Valley’s most exciting 150 high tech companies, (including Apple, Facebook, Hewlett Packard, Netflix and eBay) the hotel is a short walk to the charming historic town of Los Gatos with its 120 upscale boutique shops, Bocce ball club, lively brew pubs and restaurants. This idyllic location in the heart of Silicon Valley invites some extra time to explore the natural beauty and recreational opportunities in the area. Los Gatos stands adjacent to redwood forests and rolling vineyards. Just over the mountains is the Pacific Ocean, sandy beaches and the renowned boardwalk of Santa Cruz. For multi-tasking business travelers looking for the perfect balance of Silicon Valley access, close international airport proximity and wine country relaxation, Hotel Los Gatos is a smart way to make the most of your visit.